When it comes to LASIK eye surgery cost, the procedures remain unregulated on the open market. The Food and Drug Administration (FDA) is empowered to approve the sale of lasers deemed “reasonably safe and effective” for LASIK procedures in the U.S. But there is no government oversight of how doctors manage or market LASIK practices – or how much they charge for LASIK vision correction surgery. Take our free online assessment and see if you are a good candidate for LASIK. You may find that your eye prescription is “too strong” (a correction greater than 1.25 diopters) so you are not considered a suitable candidate for super low pricing. The technology used is out-of-date and not as precise or effective as most current technology. Some costs typically included in overall LASIK fees, such as pre-op services and follow-up visits, are not included low-price offers. 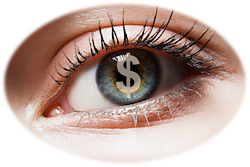 It’s important to compare “apples-to-apples” pricing when you are considering LASIK centers. Ask questions to determine that the surgeon is trained and experienced in using the most advanced technologies, has plenty of experience and satisfied patients, and is transparent and honest about all costs involved. Quality surgeons like Dr. Kenneth Lindahl at THE Rochester Eye and Laser Center will only approve LASIK procedures after a thorough examination and will openly discuss the advantages and potential risks of LASIK. The Rochester Eye & Laser Center also offers Special 0% Financing that starts as low as $149 per month depending upon the procedure. Saving money is a good thing, but your vision and LASIK results are not something to risk for a “low price.” So while it may be tempting, don’t let a so-called “deal” be the determining factor in your LASIK surgeon choice. Rochester Eye & Laser Center offers FREE LASIK Evaluations in our downtown Rochester office. Contact us today at (585) 232-2562 to schedule your no-cost, no-obligation LASIK exam, or visit our website rochestereyecenter.com to learn more about this exciting vision correction procedure. With better vision, you’ll see more, play more, and experience more!